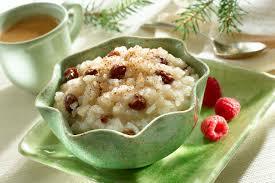 Arroz con Dulce - Puerto Rican Rice Pudding - Tienditadepuertorico.com - Buy Puertorican Food Here!! ginger. Bring to a boil. Pour the liquid through a colander into a bowl; discard the spices. 2 Combine the spiced water with the coconut milk and 1 cup water in a large saucepan. absorbed.) Pour onto a platter and sprinkle with cinnamon.